High altitude, distance from large bodies of water and powerful chinook winds make the Rocky Mountain West a dry gardening environment even in years of higher than average rain and snow. The region's steep mountains have a major impact on where and how precipitation falls. Instead of a single mountain chain, the Rocky Mountains are made up of about 100 separate ranges stretching from New Mexico to British Columbia. Similarly, the Salvia genus contains far more species than its iconic Red Sage -- also called Scarlet Sage and known scientifically as Salvia splendens. The Salvia genus contains about 1,000 mint family (Lamiaceae) species referred to as the "true sages," which are native to many parts of the world. One that is native to Colorado and Utah is Prairie Sage (Salvia azurea). Native or nonnative, many sages thrive as perennials or annuals in the climatic extremes of the Rocky Mountain West. 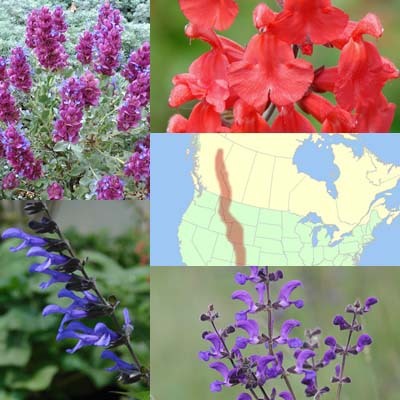 A list of suggestions for the region, including Prairie Sage and Salvia companions, is available at the end of this article. The Rockies encompass large swaths of Colorado, Idaho, Montana and Wyoming along with smaller parts of New Mexico, Nevada, Utah and Washington. The region is vast and covers alpine, desert and steppe lands (high plains prairie east of the mountains) along with loamy garden oases in cities and suburbs. The size of the area is one reason why we included its lower end -- New Mexico and the southern parts of Colorado, Utah and Nevada -- in a previous post titled Getting Started: Salvias for the Southwest. This article covers the northern parts of Colorado, Utah and Nevada as well as the entire states of Idaho, Montana and Wyoming. Often, a plant's look is the key factor in whether a new gardener selects it. Color, form, foliage shape and texture are important. However, plants fail if their needs for certain growing conditions aren't met. Let's take a quick look at what these conditions are like in the Rocky Mountain West. A region's average precipitation is based on rainfall and snowfall. The rule of thumb for comparing the two is that 10 inches of snow equals about 1 inch of rain. However, the U.S. Geological Survey notes that if snow is powdery, it contains less water per inch. Sperling's Best Places website reports that average rainfall nationwide is 39.2 inches, and average snowfall is 25.8 inches. Using the rule of thumb for snow conversion, those figures roughly equal a national average of 42 inches of rain. Based on the Sperling statistics, one of the wettest metropolitan areas in the Rocky Mountain West is Salt Lake City with an equivalent of 32 inches of rain yearly. One of the driest is Boise, Idaho, at 17 inches. This raises another rule of thumb: When selecting plants for Mountain West landscapes, it helps to pick ones that are drought resistant yet can handle occasionally intense precipitation. When watering drought-resistant sages, keep moderation in mind. Overwatering can be more deadly than sometimes neglecting to irrigate sages. Soil pH is a measurement of its chemistry ranging from 1 to 14. Soils that measure below the midpoint of 7 are considered "acidic." Ones greater than 7 are "sweet" or alkaline. Alkalinity can be a problem for plants that prefer a pH between 6 and 6.5 -- the level found in many garden soils that are well amended with organic matter, such as compost. Western soils are high in iron, but their alkalinity makes it difficult for plants to access the iron -- an element that helps plants photosynthesize solar energy and feed themselves. The great news about many Salvias is that they grow well in both acidic and alkaline soils. However, they need good drainage so their roots don't suffocate. In the Mountain States area, the naturally coarse texture of many soils aids drainage. However, compacted clay soils are also common to the region and need amendment with organic matter to loosen and aerate ground for better root growth. Raised beds filled with compost and loamy top soil are also good choices for improving drainage. The ability of a plant's roots to survive winter cold is rated by the U.S. Department of Agriculture. The USDA Plant Hardiness Zones Map divides the nation into 13 cold hardiness zones based on average annual minimum temperatures. Each zone differs by 10 degrees. Wyoming, zones 3 to 6 (Zone 4 dominates). You can see that USDA zones 4 to zone 6 prevail throughout the region. Whereas Zone 4 has an average minimum temperature of -30 degrees F, the minimum in Zone 6 is -10 degrees F.
When selecting perennials, it's best to choose ones that are rated as being hardy for your local zone or colder zones. For example, the Denver metro area is predominately Zone 5, so plants with a rating of Zone 5 or less will have the greatest chance of succeeding there. But many gardeners like to experiment and push limits. Sometimes a Zone 5 plant may succeed in a Zone 4 area or a Zone 6 plant may do well in Zone 5, especially if protected with winter mulch such as a thick layer of leaves. Here is more information about USDA Plant Hardiness Zones. To learn more about winter protection of Salvias, please click here. Also, keep in mind that some fast growing, long blooming plants that are perennial in warmer winter regions may grow well as annuals in the Rocky Mountain West. One example is Salvia VIBE® 'Ignition Purple', which is included in our plant list here. Different types of Salvia have varying needs for sun exposure ranging from full sun (minimally six hours a day of direct light) to full shade (so little light that no shadows are cast). Partial shade refers to conditions in which a plant receives dappled sunlight, such as under a leafy shade tree, or is located where it will receive more hours of shade than sunlight. In high altitude gardens where air is thinner, sun exposure is more intense. Gardeners in the Rocky Mountain West sometimes find that full sun plants, including Salvias, need some shade during the day. This is especially true at the peak of summer heat. When mulching Salvia flowerbeds to conserve moisture from spring to fall, gravel is a good choice. Or, if you prefer bark, don't mulch up to the base of Salvias, because this may damage the plants. Bloom season is another important question when choosing Salvias. Numerous sages are at their flowering best in autumn and winter in warm climates. But in cold-winter regions, it can be risky growing plants that don't begin blooming until mid- to late autumn. Fortunately, many Salvias appropriate for the Rocky Mountain West have long flowering seasons and begin flowering in late spring or early to mid-summer. We note bloom seasons in all the plant descriptions below. Other information included in each listing indicates whether a plant attracts bees (honeybees and wild bees), butterflies and hummingbirds. As to deer, which can be lovely yet damaging visitors in western gardens, they generally avoid Salvias. This likely is due to the essential oils of mint-family plants that deer don't find palatable. But keep in mind that there is no such thing as a truly deer-proof plant. The following Salvias and companion plants are good choices for the Rocky Mountain West. If you have questions about any of them or other plants in our online catalog, please contact us at Flowers by the Sea. One of the quickest ways to search our online catalog is with the FBTS Salvia Finder, an easy-to-use tool that allows you to input local growing conditions and preferences such as plant size and color. You'll also find lots of categories for searching our catalog in the blue menu bar at the top of each page. For example, if you want a detailed list of Salvias native to a specific region of the nation or the world, the menu bar includes a Salvias by Origin category. We provide lots of tools to help you find what you need and grow beautiful gardens. More questions? Please give us a buzz. Superb packing and beautiful plants! So glad I bought from FBTS! This has been the best packaging of plants I have ever seen. They arrived in good condition and I will plant them today.